PTI Manager Jesse Williams explainings the situation demonstrated by Petzl Rep Brian Brechwald & Storme Mathisen from ZipRider. The Petzl Technical Institute team was happy to run a workshop on adventure park rescue and evacuation at the Ski Area Management (SAM) Summer Ops Camp. 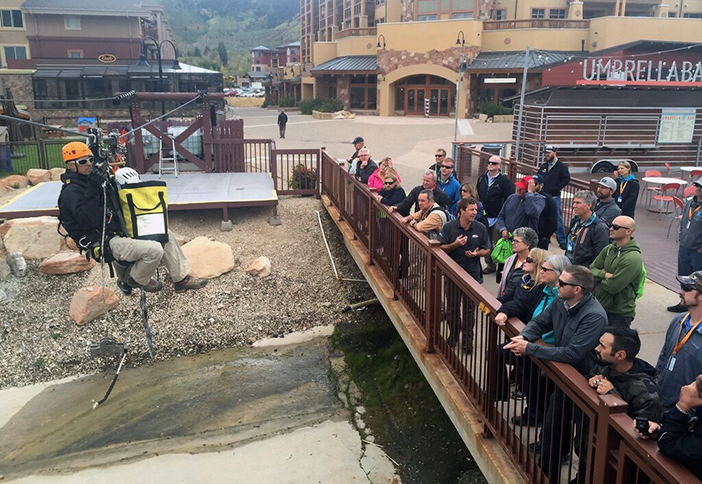 With a focus on the latest standards, tools, and challenges in high angle rescue for summer and winter adventure parks, the workshop provided a great opportunity for skiing experts to begin to understand the unique challenges, and similarities, of running “off season” activities.